Solidarity Sing Along at the Wisconsin State Capitol. Photo from Solidarity Sing Along / Facebook. Dubbed the 'longest continuously running singing protest in history,' the Solidarity Sing Along is about to celebrate its 350th performance. MADISON, Wisconsin -- More than once, left-leaning music critics have pronounced the demise of the Seeger-esque, Almanacs labor-themed song. Along with Pete goes the whole genre of political folk revival, including, for the most disparaging, Bob Dylan and Joan Baez. A veritable mess of clichés, our critic snaps. This music, especially the lyrics, neither clever nor funny nor inspiring. Solidarity singers continue to gather at the Capitol in numbers ranging from 20-30 to more than 200. Barring officially scheduled events, they circle the Rotunda floor, with their conductor strategically placed before the bust of Robert M. La Follette, the state’s most beloved opposition politician. 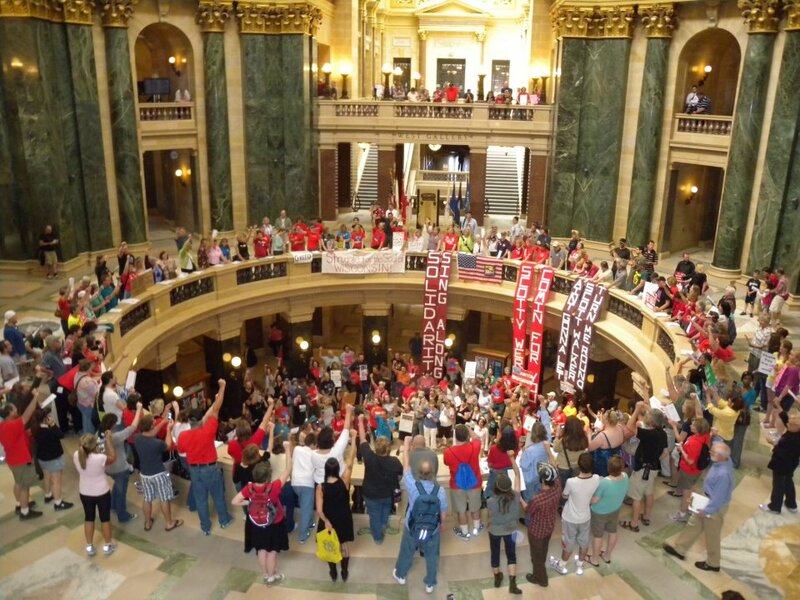 Solidarity Sing Along group outside Wisconsin State Capitol. Photo by Rebecca Kemble / The Progressive. On other days they brave the cold winds, rain, and snow of the Wisconsin winter and, in recent weeks, revel in the unusually warm temperatures. For the outdoor gatherings (Walker banned all instruments from the Capitol), musicians bring an assortment of instruments -- violins, guitars, mandolins, sousaphones, and squeeze boxes -- and play together as “The Learning Curve” pick-up band. 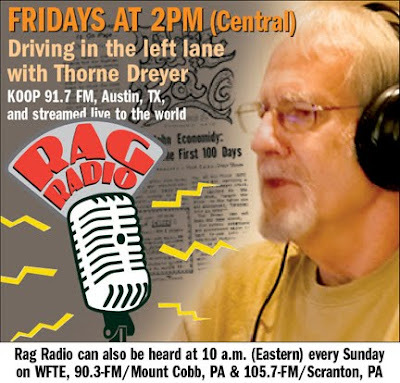 The selection of songs varies from day to day, but every sing-along concludes with the group’s theme song, “Solidarity Forever.” A timely favorite is “Roll Out the Roll Call,” with new lyrics by Sheboyganites Frank and Mary Koczan. 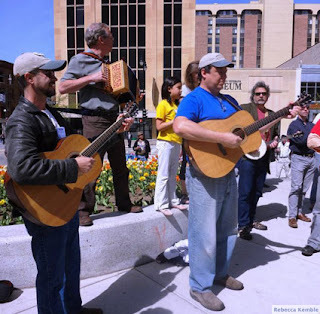 “Recall Scott Walker…/Give him a kick in the rear!/ Recall Scott Walker…./Toss him right out on his ear!” If the chorus of Ralph Chaplin’s labor classic routinely produces raised fists, the updated “Beer Barrel Polka” invariably stirs a few in the crowd to polka, German-style. This is Wisconsin, after all. 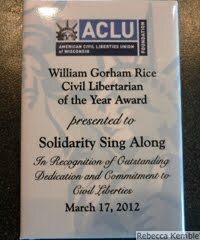 On March 17, 2012, the American Civil Liberties Union of Wisconsin presented Reeder, on behalf of the Solidarity Sing Along, a much deserved award, the William Gorham Rice Civil Libertarian of the Year Award “for the expression of the First Amendment rights of free speech and freedom of assembly.” Even more recently, Leadership Wisconsin, a group that promotes the development of leaders to strengthen communities, tagged Reeder for yet futher recognition.